Curry Supply is more than a typical upfitter – we are a manufacturing company with strong strategic industry alliances that ensure the precision and success of every commercial service vehicle upfit. Our entire team lives and breathes in a culture of quality and continuous improvement. This culture lets us approach our customer’s most urgent needs and toughest challenges in a thoughtful way. We seek to understand every aspect of an application so we deliver rigorously engineered solutions. When people ask what sets us apart from the competition the answer is… EVERYTHING! With over 150 work ready units in stock, our trucks and equipment are ready for the job. We manage logistics from start to delivery, coast to coast and ship globally. That means exceptional parts and service support wherever you’re located, whenever you need it. From detailing through complete rebuilds, we restore old equipment for maximum efficiency and reliability. Turn to us for solutions in leasing, financing, flex-line purchasing and more. Constant Finite Element Analysis (FEA) testing ensures best-in-class products. 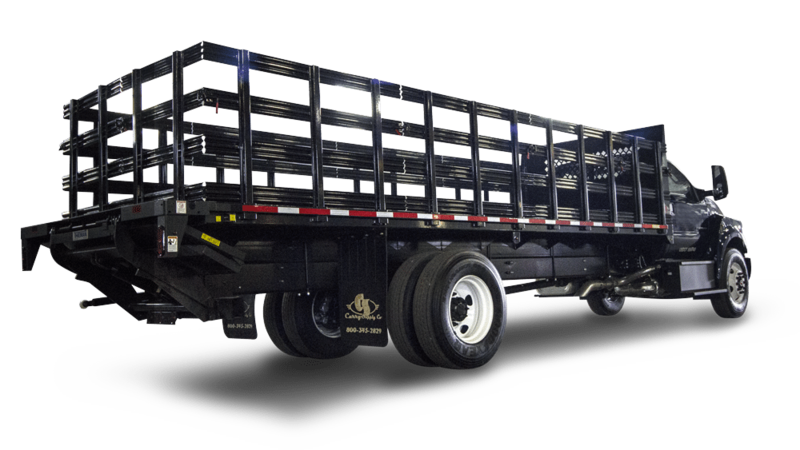 Find out how easy hauling can be with rugged, hardworking Curry Supply Flatbed Trucks.